Afghanistan will hang on to U.S. military equipment following the withdrawal; Pakistan will receive nothing. The top U.S. commander in Afghanistan, General Joseph F. Dunford Jr., finally clarified the fate of surplus U.S. military hardware in Afghanistan: much of it will be staying in Afghanistan following the U.S. and NATO withdrawal scheduled for later this year. This contradicts earlier reports that the United States was negotiating a deal with Pakistan for the transfer of significant quantities of equipment, including mine-resistant ambush-protected (MRAP) vehicles. Dunford’s statements clarifying the surplus hardware situation come after he indicated to the Senate Armed Services Committee that August 2014 looks like a realistic deadline for the political and diplomatic process of getting the Bilateral Security Agreement (BSA) signed. 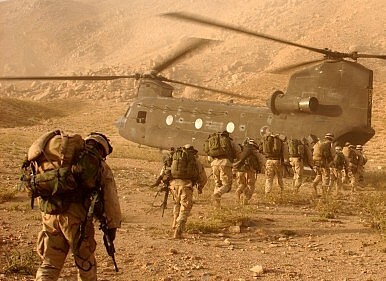 The Pentagon will require a few months of logistical planning in order to successfully extract desired supplies and hardware from Afghanistan via the Northern Distribution Network. Currently, the BSA is stalled pending Afghanistan’s elections; Karzai was reluctant to sign the agreement, arguing that it was a task for his successor (in addition to generally feeling that a continued U.S. presence in Afghanistan post-2014 would be detrimental to Afghan interests). If the BSA is signed on time, the U.S. will be able to keep a small force of between 3,000 to 10,000 troops in Afghanistan for limited counter-terrorism operations and training. There was never doubt that the United States would likely leave behind some hardware in Afghanistan for the Afghan National Army and security forces. The prospect of transferring arms to Pakistan seemed to make sense considering the United States could conceivably win favor in Pakistan by doing so, but any such sale or transfer would be perceived negatively by Afghanistan and India. The solution that Dunford and the Pentagon have favored — leaving a majority of the hardware behind — seems to follow the path of least resistance and will likely create little controversy regionally. The Afghan National Security Forces (ANSF) have matured dramatically as a counter-insurgency force in Afghanistan and will likely be able to put much of the hardware the United States leaves behind to good use in thwarting a resurgent Taliban threat. This will be particularly crucial in ensuring the security of Afghanistan should the BSA not get signed later this year due to delays. The ANSF have already received $53 billion over the past 12 years, including “160 aircraft, 100,000 vehicles, including 600 new Mobile Strike Force Vehicles, 500,000 weapons and 200,000 pieces of communications.” Adding surplus U.S. hardware from the war will only bolster their preparedness for security challenges post-2014.